Did the Cast of The Handmaid's Tale Just Spoil the Big Cliffhanger? Offred (Elisabeth Moss) heads into a black police van at the end of season one. Margaret Atwood’s The Handmaid’s Tale ends on a major cliffhanger: Offred heads willingly into a black police van, uncertain of her fate. She will either be arrested for treason, or smuggled to safety. The Hulu series may have ended its first season the same way, but since we’re headed into season two, we know there’s more story to tell. We’re still being kept in the dark about the conclusion of season one’s cliffhanger, but the actors may have spilled the beans about where Offred (Elisabeth Moss) will end up. Offred, sporting a red gag, readies herself for the hangman’s noose in a season two trailer. Sorry folks, looks like she didn’t make it out. Speaking at PaleyFest, several of the actors shared new details about what their characters would be up to in season two. In our line of work we often expect marketing to give away a certain degree of the story to lure audiences in but regardless, the actors’ revelations were a bit surprising. The most interesting revelation came from Ann Dowd, who plays Aunt Lydia. According to Deadline, Dowd shared how her character is lashing out against Offred, who’s becoming more and more rebellious, but Aunt Lydia has to hold back her temper because Offred is expecting a child. Given how Yvonne Strahovski also revealed on the panel that Serena Joy and Commander Waterford (Joseph Fiennes) will share a “common front against Offred,” this indicates she’s still very much a part of their lives. “The one thing that [Serena] wants is that baby—that is her greatest survival mechanism in a world where she, too, is challenged and doesn’t have much of a voice, either,” Strahovski said during the panel. Seems more than likely that Offred wasn’t successfully taken to Mayday headquarters and instead got apprehended and punished... only to be spared because she’s expecting a baby. This matches footage seen in the trailer of Offred sporting the same gag Ofglen (Alexis Bledel) wore during her trial—something I’d dismissed as a possible nightmare sequence used in the trailer to fake us out. 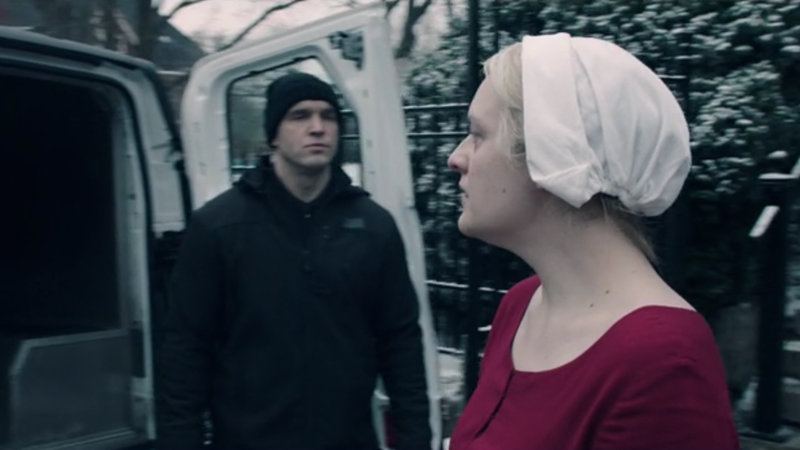 Of course, all of this doesn’t mean Mayday wasn’t trying to help Offred. It’s possible she was being smuggled to safety but was later caught and brought back to the Waterford residence. However, I tend to believe that she really was being taken into custody, because Nick (Max Minghella) is full of crap and can’t be trusted. The Handmaid’s Tale returns April 25 with two episodes, and the rest of season 2 will be released weekly.